Water makes up nearly 70 percent of the horse's body weight, so it's not surprising that water plays a major role in treating equine injuries and in conditioning and rehabilitation. "Hydrotherapy is a very general term which really means 'treatment with water.' Hydrotherapy is using water to accomplish a specific effect and usually refers to some physical therapy principle," explains Patrick T. Colahan, DVM, Diplomate ACVS. Colahan is a Professor Emeritus of Surgery, large animal surgery specialist and former Director of the Equine Performance Laboratory at the University of Florida Large Animal Hospital in Gainesville, Florida. Although many people consider swimming and underwater treadmills forms of hydrotherapy, Colahan notes that these are actually alternative forms of exercising and conditioning, and in some cases rehabilitating, horses. Either cold or warm water can be used in hydrotherapy, but cold water therapy is typically prescribed when the goal is to reduce heat and inflammation. Heat should never be applied to an acute injury. When a horse is injured, pain, heat and swelling are found in varying degrees, depending on the severity of the injury. Fluid pools in the injured area, and blood flow and tissue metabolism are altered. "Cold applied for a short period of time causes constriction of the vessels," Colahan notes. "After this, you get an increase in arterial blood flow to the chilled area and an increase in venous flow returning blood to the heart and lungs. Cold increases blood flow through the area and aids in healing." Applying heat to the area increases arterial flow, but does not increase venous return the way cold treatment does. "This can increase the fluid pooling and does aid the return of normal metabolism and healing," he adds. Applying cold water or ice reduces the amount of accumulating fluid in an injured area and also somewhat numbs the area, causing a topical analgesic effect. Application of cold water therapy for 20 minutes at a time, multiple times per day is often recommended for new injuries to reduce inflammation and increase blood flow. Care must be taken when using ice, as direct application of more than 15 to 20 minutes can lead to tissue damage. Cold water hosing is a common form of hydrotherapy, but when applied via hose, the water may not be cold enough and the water pressure isn't uniform. Thus, the invention of boots that circulate cold water over an injured area, provide an effective way to decrease the temperature, and in some cases offer a massaging pressure as well. ­­While boots for cold water therapy are most effective for treating limbs, ice is very useful in treating large muscle masses. "You can fill a Styrofoam cup with water and freeze it. Then take the frozen cup and use the exposed ice to rub and massage the horse's body. Just keep peeling back the Styrofoam as the ice melts," says Colahan. "This is a very effective and inexpensive method. Although it takes time and your muscle power to do the massage, it can be very effective for horses with sore backs and rumps, et cetera." When dealing with a wound, you may use water to clean it initially, but don't use pressure to force water directly into an open wound. Follow your veterinarian's advice when using any form of hydrotherapy on a horse recovering from a wound or surgical site. Excessive use of cold water or ice can hinder the formation of new tissue needed to heal the wound. Using water as therapy has several beneficial effects: it allows you to change the temperature of the area being treated, and depending on the force of the water, it can also have a mechanical massaging effect. Water can also provide buoyancy and resistance to muscle groups, increasing the value of exercise. Underwater treadmills are often used for horses with tendon and ligament problems. They can provide a very useful gradual transition back into exercise for horses recovering from injury, and can also help horses regain range of motion after joint surgery or injury. Horses recovering from breathing problems can benefit from exercise on an underwater treadmill. "With an underwater treadmill you can start adding some load on their limbs, but you can reduce the amount of weight they're putting on their bones because they are partially supported by water," says Colahan. "It can be made more of a muscle-developing exercise if you reduce the amount of water so they're not buoyed by the water, but still have the resistance of the water to work against." Swimming is an excellent way to condition a horse without putting a load on his skeletal system, Colahan notes. "You can get considerable cardiovascular and muscular conditioning with swimming, although it's not identical to working on the ground." Because of the cardiovascular workout involved, he adds that horses with breathing difficulties shouldn't swim. Much has been written about the positive effects of exercising horses in the ocean, due to the anti-inflammatory effect of cold seawater. When it comes to therapeutic modalities, efforts have been made to use salt water in various treatments. At Kentucky Equine Sports Medicine and Rehabilitation Center (KESMARC) in Versailles, Kentucky, owner Kirsten Johnson uses different forms of hydrotherapy on a regular basis for many of their rehab cases. "The horse's injury, discipline and disposition each play a role in what types of therapy are used in rehab," explains Johnson, who has made a career of rehabilitating horses for the past 20 years. She uses hydrotherapy extensively and has for many years. Johnson considers KESMARC to be "the gray area between injury and return to training." That said, she adds that every case is different. "I can take a two-year-old colt with the same injury as a five-year-old broodmare and their protocols will be totally different," Johnson notes. "That's why equine rehab is such an art form. Any time you deal with a horse, you have to deal with their psyche and what you can safely do with that horse. You start at the beginning with a good diagnosis and a good plan and move forward from there. You want to know what's wrong, not think you know what's wrong, and you have to monitor the injury through the rehabilitation. We have the veterinarian's input at every turn during the rehab." While KESMARC uses swimming and an underwater treadmill in many cases, Johnson emphasizes that there's nothing magic about adding water to the rehab equation. "Water doesn't cure everything. Water's just a piece of the puzzle when you know what you're trying to fix. Water therapy is clearly being proved to be a positive option for post-injury care. It's about using the water as a therapeutic or rehabilitative modality to set the horse up for better healing in a controlled exercise regime." Johnson notes that water therapy is not about bringing a horse back quicker after injury, but rather about "the quality of healing and the quality of the athlete you get back," she notes. "But you do save a lot of time because the horse has quite a bit of conditioning on him when he returns [to training], as opposed to a horse that has been let down and turned out and goes back with no conditioning at all. You save money in the long run." KESMARC has an Aquatred underwater treadmill, an in-ground system that Johnson prefers over models that are above ground, simply because she feels it's safer. The Aquatred provides full-body exercise for the horse and offers 40% to 60% buoyancy, which helps horses regain range of motion and increase the length of their stride. The water resistance and lack of concussion allow horses to work the same muscle groups used in normal ground work. "We use the Aquatred for bleeders, for horses that have upper and lower airway problems, for stifle and back problems, and for horses coming back from a long layoff that need soft conditioning after standing in a stall for a long time, for example, after a fracture," says Johnson. "It's a great alternative to hand-walking fractious horses. Horses enjoy the Aquatred. Swimming is work; the Aquatred is fun." Controlled movement in water may help increase bone density. Some rehab plans include both the Aquatred and swimming, depending on the individual horse's case. One is not better than the other, Johnson points out; they are just different. Not only does rehab play a crucial role in the horse's physical healing, but Johnson has found that it greatly helps the horse mentally. "Often the horse has a primary injury and then a secondary injury; he's been compensating and hurting for a long time. You put him in rehab instead of just turning him out, and he starts to feel good again, his immune system is stimulated, and the concept of pain is out of his psyche. A lot of times this doesn't happen with turnout alone. You turn out a high-end equine athlete and they often aren't really happy." There is also the real risk of reinjury when you turn a horse out that has been recuperating in a stall for several months and has only been hand-walked for exercise. Johnson fervently believes that rehab is a crucial part of bringing a horse back into training after injury and/or surgery. Done properly, the equine athlete will be fit and strong enough when he returns to training that he is less likely to reinjure himself due to lack of conditioning. Rehab also benefits the horse mentally, something that should not be underestimated. "It's hard on a racehorse that has surgery and then goes back to the track," says Johnson. "He wants to train and doesn't understand why he's being walked in the shedrow for two months. He's out of his routine. In a rehab facility, horses know their schedule and like it. Horses like routine and they thrive on it." Swimming can be used for both conditioning and rehabilitation. When used during training, it can help a horse get more fit without overly stressing limbs and joints. Many horses take to swimming quite well, whether in a pond or a pool designed for that purpose. "Swimming is more serious cardiovascular work, so you have to respect it and use it accordingly," notes Johnson. "It's not for every injury and every horse, but it certainly has a positive place when used correctly. 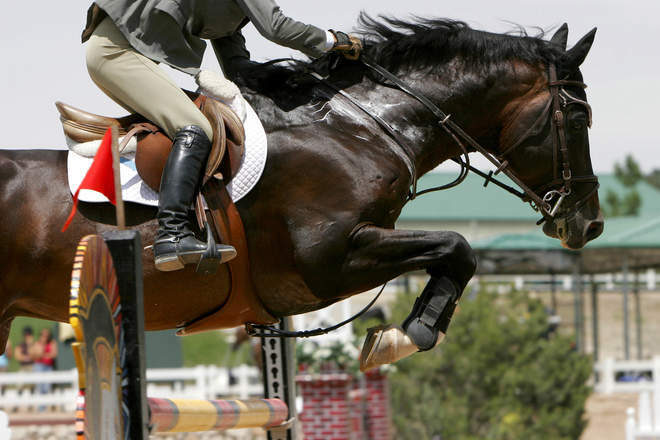 Certain injuries you don't swim, such as horses with upper and lower inflammatory airway troubles, and we usually don't swim horses that have had stifle or hock injuries, or surgery. Swimming is great for early stages of tendons and suspensories, and also for feet because there's no pounding on the foot but it's still used." Trainers who use swimming as part of their routine often find that, in addition to the cardiovascular workout, swimming helps a horse relax and settles his mind.